A new kind of puzzle game! Doctor Esker has vanished, leaving behind only a mysterious book full of puzzles written in his own hand. Nobody has cracked his cryptic codes yet. Are you up to the challenge? The game provides a deck of 73 cards which contain nine devious puzzles to solve. You can play through the puzzles solo or together with family and friends. Great for a party, a game night, or a lazy afternoon. Each puzzle is composed of a set of cards. You can solve the puzzle by reading, comparing, arranging and pondering the messages, drawings, and artwork on the cards. Solving the puzzle reveals a sequence of numbers. When you think you’ve got it, gather the solution cards corresponding to the number sequence and flip them. If you see a message or image, you’ve solved the puzzle. The hints are meant to be used! Almost nobody, even experienced puzzlers, gets through without them. Puzzles may use anywhere from 4-12 cards. The solution cards should provide a clear next step: a message made up of a part of each solution card, which usually indicates the next puzzle to try. Some puzzles rely on the arrangement of cards relative to each other. See what reviewers are saying! Alien podcasters do an unboxing. 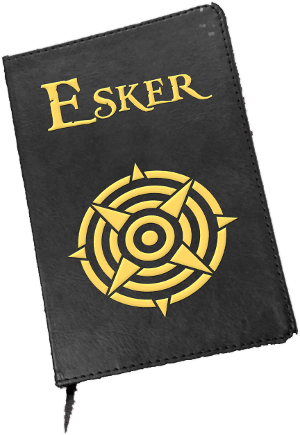 There are two sequels to Doctor Esker's Notebook in the works, called (creatively enough) Son of Doctor Esker's Notebook and Return of Doctor Esker's Notebook. There are even more puzzles to solve (18 more) in two brand new decks. Look for those coming soon.